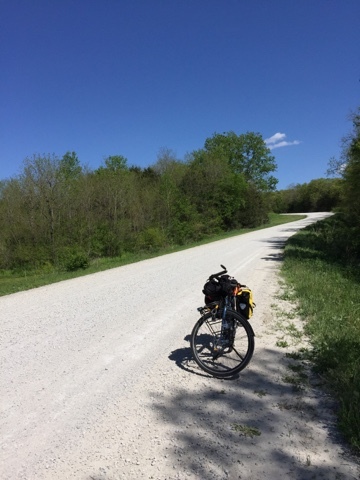 I'm gingerly riding on loose gravel, a few hundred yards from Kilbourn, Iowa. Down the steep hill to river level, I can see the road bend up ahead, probably rolling into Kilbourn and on to the bridge. A couple in a pick-up come from the wide-spot-in-the-road town and stop. They had just passed me earlier on their motorcycle. "Like the gravel?" the man asks. He is, of course, being sarcastic. The gravel is a loosey-goosey concentration exercise, just to get down to river level on the newly applied gravel. "I prefer it more hard packed," I reply. "Well, you can't get there from here. You'll have to go around, through Keosauqua." "OK, so much for Google Maps." "They've dug a deep trench cutting off the access to the bridge on each side. I guess you could throw your bike up on the bridge, go across, and then do the same on the other side." "No, thanks. I'll just go back." With a wave, my information source is gone, and I'm alone again, contemplating my next move. I wish I had traveled on around the bend in the gravel to see Kilbourn and the bridge, maybe take some photos. I didn't, though. I just disconsolately turned around and headed back up the hill, soon pushing my bike up the grade, feet slipping occasionally in the loosey-goosey gravel. Austin Park currently has gravel pads for primitive camping. There is no electric or water available at this time. In 2008 this area was hit by large ice chunks. These natural events plus several floods later has left it in a more primitive state. At this time the Conservation has no funding to rebuild it. I see it with my mind's eye--early spring on the Van Buren River and the splitting sound as huge chunks of ice crack, mass together, and move downriver, scouring the banks, wiping out the campground. I wonder if I heard the man in the pickup wrong. Maybe the bridge was damaged in 2008, not 2000. My trip to Kilbourn had been made enjoyable because of a tailwind--riding with a push from the friendly north wind. 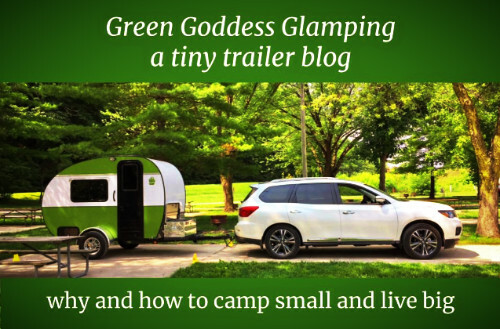 However, my overnight trip took a change for the worse with my decision to camp at Morris Memorial County Park, fifteen miles away, most of the directly into the wind with one staight northern route on Stockport Road. I had my Rohloff gearing down to gear 2 or 3 out of 14 too much of the time, slowly slogging into the wind. I had planned a short 16-mile overnighter as a start to getting in shape, but it ended up 30 miles, and my legs let me know it was a bit much. Adventure cycling! The mysterious Austin County Park still eludes me, see only in my imagination as glaciated ruins and now-placid waters. I already have a new route planned, via the Douds bridge and along ten miles of Eagle Drive that skirts the Des Moines River, about twenty-five miles. It should be a great ride. Of course, assuming those ten miles of gravel are still able to be ridden. But as I've found out before, sometimes my assumptions are presumptuous.